The symbolic value of targets is what differentiates terrorism from other forms of extreme violence. Terrorism is designed to inflict deep psychological wounds on an enemy rather than demolish its material ability to fight. The September 11, 2001 attacks, for example, demonstrated the power of symbolism. The World Trade Center was targeted by Al Qaeda because the Twin Towers epitomized Western civilization, U.S. imperialism, financial success, modernity, and freedom. The symbolic character of terrorism is the focus of this textbook. A comprehensive analysis, it incorporates descriptions, definitions, case studies, and theories. Each chapter focuses on a specific dimension of symbolism in terrorism and explains the contexts and processes that involve the main actors as well as the symbolism of both the purposes and targets of terrorism. Also discussed are new religious movements, which represent another important aspect of terrorism, such as Aum Shinrikyo, the Japanese cult that used sarin gas in the Tokyo subway in 1995. Over forty areas of symbolism are covered throughout the chapters, including physical and non-physical symbolism, linguistic symbolism, the social construction of reality, rituals, myths, performative violence, iconoclasm, brand management, logos, semiotics, new media, and the global village. This allows for an in-depth examination of many issues, such as anti-globalization, honor killing, religious terrorism, suicide terrorism, martyrdom, weapons, female terrorism, public communication, visual motifs, and cyberspace. Main concepts are clearly defined, and followed by theory illustrated by international case studies. Chapter summaries, key points, review questions, research and practice suggestions are recurring components as well. 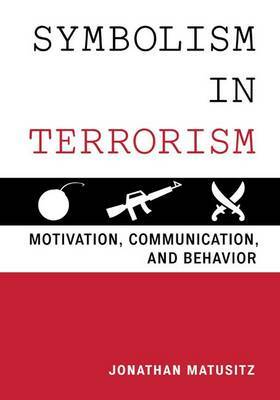 This groundbreaking text encompasses all major aspects of symbolism in terrorism and will be an essential resource for anyone studying terrorism.